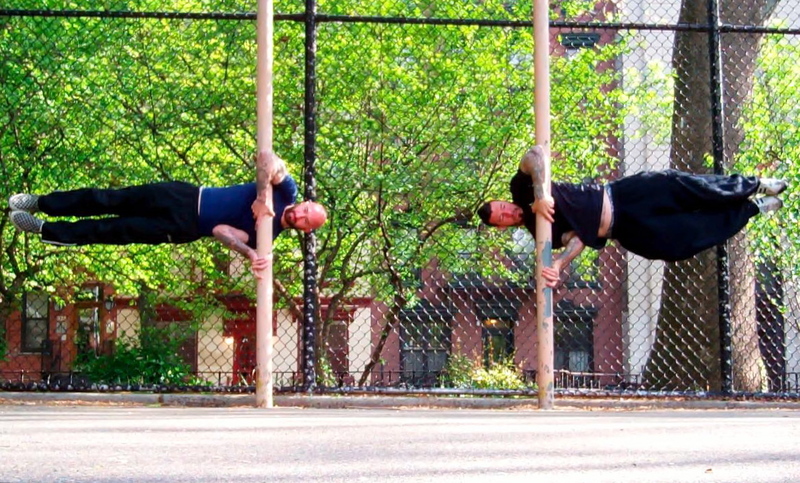 The human flag is one of my favorite bodyweight feats of strength. It’s also the exercise that I get asked about more than any other. 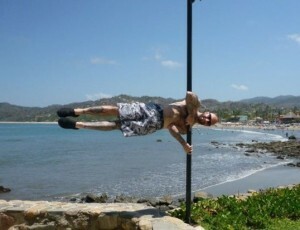 Unfortunately, most people who ask about the human flag aren’t strong enough to actually begin practicing toward it. The clutch flag is a less difficult variation that’s still visually impressive and just as much fun to practice. Additionally, working on your clutch flag can help you get a feel for the proper body alignment needed to perform a full human flag (aka “press flag”). It can also help you build the strength you’ll need to get there. The clutch flag is easier than the press flag for a few reasons. First and foremost, as your arms are not in an overhead position during a clutch flag, the length of your body becomes substantially shorter than it would be in the full flag (plus your head and shoulders are on the other side of the pole). This change in body positioning gives you better leverage. Additionally, the clutch grip allows you to squeeze the pole with your entire torso, not just your hands. Though the two moves are similar, they work your muscles a bit differently. The press flag heavily stresses the shoulders (particularly on the bottom arm), while the clutch flag puts more emphasis on the biceps. It’s more of a pull than a push as far as the arms are concerned. 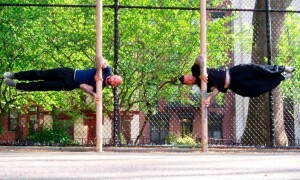 When you can do a clutch flag for 20 seconds or longer, you might be ready to start training for the full human flag. 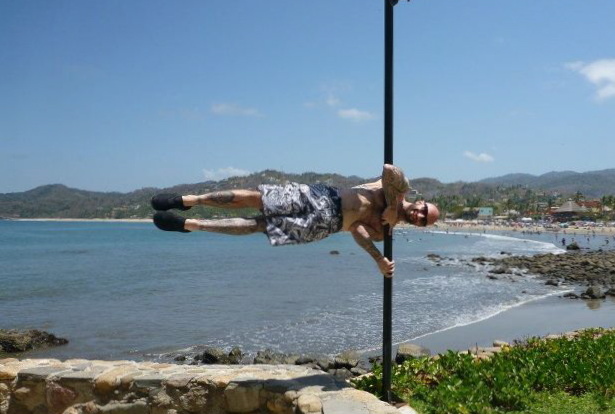 For more information about the clutch flag, as well as the standard human flag, check out the book Convict Conditioning 2, which features Danny and me on the cover! Awesome, Al! I’m currently working through this progression from CC2. Right now I’m doing the Diagonal Tuck Clutch. I love this, and can’t wait til the day I get the Full Flag! Thanks, Steve! Stay the course and your day will come. That is really an exciting reading and a great video as usual. And now hold firm and I beg your pardon for my excitiment that I FINALLY ACHIVED MY FIRST EVER BAR MUSCLE UP!!! YIIIIHUUUU. All the tutorials on your site and all the descriptions was so much helpfull. My 9 months of calisthenics workouts finally paid off. I really gave any conviction and stregth I have to achieving the muscle up and I did it. It was a muscle up with both hands turning into the muscle up. I never tried it with one hand at a time. Well I will shoot a video and send it to you. You maybe can criticize about it. Yea? Know my next goals are a front lever, a handstand, than a planch…etc…the list goes on 😀 the jurney never ends. Congrats, Anil! You’re living proof that hard work and consistency gets results! Looking forward to your video. Thanks,Al! This is Exactly what I needed! A Great progression! Convict Conditioning, Volume 1: The Prison Pushup Series. Any comments you have would be appreciated! Al, I am so glad that you introduced this variation here! I recently purchased both of your books as well as Convict Conditioning 2 (I borrowed CC1 from a friend and read through it, and while the information in it largely is in line with my views, there are some minor issues I have with the progressions themselves; for example I feel the ultimate progression of the hanging leg raise should be the 1 arm variant, and as for the one arm handstand push up…honestly I feel that a one arm elbow lever > one arm handstand press is more realistic and still would require superhuman strength, or that a 90 degree push up would be an excellent ultimate, unifying progression of both the handstand push up and “normal” push up progressions…but I digress). I am not nearly strong enough for the Press Flag yet, in fact I feel unsafe simply trying to lift off of the ground! But, the Clutch Flag is something that I find much more manageable, since I can actually do it for a few seconds. In fact, I think that playing around with the one arm elbow lever carries over very well to the Clutch Flag. In any case, this exercise is pretty much exactly what I was looking for! I am very excited about the Trifecta as well, and I intend to start using towels during my pull up training. As for fingertip work…I am presently able to do a one arm handstand on the 5 fingertips (with a wall, that is)! While much of the information from Raising The Bar I had already gathered from my own independent research, I found the book to be a very well organized, concise training manual for pull up bar calisthenics. In addition, there were quite a few smaller tips and hints that had not occurred to me. Your approach to progression throughout this book is more practical and efficient, in my mind, than some of the examples displayed in the original Convict Conditioning. While the progressions in CC largely seem like they would work, some of it just comes across as a little out of step, such as how he never incorporates one arm negatives into the pull up progression series. Frankly, I skimmed through A Zen Approach to Everyday Fitness, however a lot of your philosophy reflects my own. My own philosophical ponderings (in general) tend to more closely approximate eastern thought than western thought, I find, and with your Buddhist influence, I assumed that this would be the case. However, as with Raising The Bar, the way you thoroughly and concisely lay out and explain the subject matter really fleshes out the details in a way that feels almost as though I am having a conversation with a friend. Al, once again, I am inspired by you. The exercises you have introduced to me and the rationale behind them I find to be fun, exciting, and functional. Keep up the progress, my man! PS as an aside, are you still training for planche push ups? I would love to see these from you someday, and also the 90 degree push ups! Wow – thanks, Robby! I think that comment was longer than my blog post! I really appreciate your kind words and I’m glad what I am doing has resonated with you. As for the planche and 90 degree push-ups, those are still on my list, but right now my top priority is preparing for the NYC triathlon in July. (More on that in an upcoming blog post). Once the tri is over I can hopefully go back to making the planche priority #1. That exercise has become my white whale. Those guys got some balls! Wow! Hey, Al, we never met but your father and I were buddies in the sixties. Send him and your mom my regards. I must say that your acrobatic feats are amazing. I get winded just walking a few miles, but that’s a great improvement from 2006. I could not even turn over in bed while in ICU for over a month. You make it look so damn easy. I just might try to do 15 knee-bends later. Thanks, Richard! I’ll send your regards to my folks. Fifteen knee bends is a good start! Yes that is quite common. I recommend trying to get comfortable with the hold on both sides, though your dominant side may always be a bit stronger. I have this same issue. To exacerbate the situation, my left shoulder has a tendency to pop when the left arm is on top, and after I finish it feels weird, and not in a good way. I simply don’t feel safe training this move on the left side, so instead if I do this move it’s usually as a strength/skill test on the right side (or to show off). As an alternative, I work on front levers, back levers, and L sits. L sits build a very solid base level of core strength, while the back lever is about the same level of difficulty as the flag however it is symmetrical so you don’t need to train both sides separately. Same with the front lever, except, of course, it is harder. There is a point to be made for the flag, though, in that since it is unilateral, you could build more pulling and pressing strength on both sides, when worked equally on both sides, than the back lever. I don’t really know for sure, though; you should probably be doing all of these exercises, or at the very least, whichever ones you are able to safely do and/or have equipment for. Just got my first clutch flag! thanks to you man, also big shout out to TSP’s own Bob; clutch appreciated. Congrats, Michael! And Bob is the man!